Colligo Marine® Dux Lifelines are the strongest and toughest synthetic lifelines available. If the lashings are changed every 2-3 years your lifelines will last least 5-8 years in the tropics. 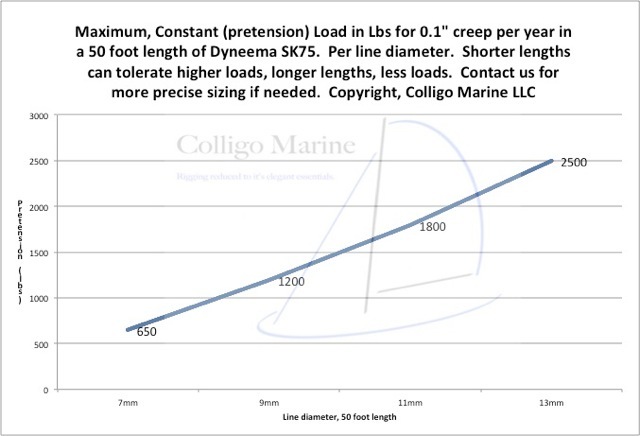 Colligo Marine can customize synthetic lifelines for boats of any size! Dyneema lifelines are approved for offshore use by United States Sailing and the International Sailing Federation. Line is lighter and easier on the hands (& sails) than wire! If your synthetic lifelines get damaged the weak points are visible and the line gets fuzzy. These lifelines are totally inspectable for your safety! We use Dynice Dux SK-75 which has similar material stretch to that of stainless steel. 5mm Dux has a breaking strength of 11,000 pounds. It is pre-stretched at elevated temperatures to virtually eliminate constructional stretch. Other advantages include weight savings, DIY flexibility, and no corrosion! Click here to see examples of Lifelines here. "Yeah it's not as tough as steel but, hey, they make protective butcher's gloves out of it"
Considering Synthetic Lifelines but worried about stretch and creep? Creep is a material property that is the elongation of the material over time. With Dyneema SK-75, creep is manageable by slightly over-designing. We design for a maximum of 0.1 inches (0.25 cm) of creep per year. Constructional stretch is the line elongation when an axial load is placed on the line and the braided strands. These stands are braided at an angle to that axial load and attempt to align themsleves with that load, which results in a change in line length. Unless pre-stretched, all braided lines have constructional stretch. Colligo Dux is pre-stretched at elevated temperatures to virtually eliminate constructional stretch and no pre-tensioning is needed. Older PostPhantom V wins the 2016 Kings Cup Regatta with Colligo Marine® Rigging!